Featuring necklaces made of wishes; an underground shop dealing in teeth; magical tattoos; a wishbone on a cord, DAUGHTER OF SMOKE AND BONE is a thrilling story about Karou and her secret life as an apprentice to a wishmonger. Karou manages to keep her two lives in balance. On the one hand, she is a seventeen-year-old art student in Prague; on the other, errand-girl to an inhuman creature who deals in wishes and is the closest thing she has to family. Her life is surrounded by mysteries she is desperate to unveil. 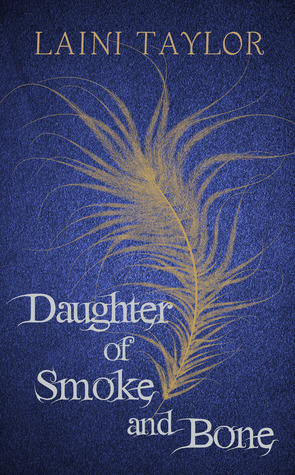 Daughter of Smoke and Bone is probably one of the most original books I have read this year and a gripping read. I was hooked from page one and didn't want it to end. At the start of the book you meet the main character Karou. I loved her as a character. She is a mysterious 17 year old art student with crazy blue hair and the ability to do magical things alongside a hidden life which she hides from her friends. Also her background is very mysterious as even she doesn't quite know where she came from or who she actually is. I loved her general quirkiness and how she stood up for herself and how she dealt with all the weird and wonderful things thrown at her on a daily basis. The world created in this book is so uniquely strange and whilst uncomparable it I were to compare it I would point at Phillip Pullman's Dark Materials world. That's not to say it is anything like it but it is similar is how the world is like our own but totally not because of all the different things going on. I loved all the crazy little details that were thrown in and just enjoyed learning about what Karou's world was like as the description was done so beautifully. 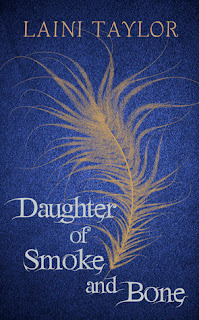 The main plot the runs throughout this book is Karou's quest (not sure that is entirely the right word) to find out who she actually is which is spurred on when her foster family are attacked and disappear and the mysterious portals she slip through to other parts of the world are closed. She finds herself being hunted down and through this meets Akiva who is the person who finally unfolds the truth about who she actually is. At this point in the book when the twist was reveals I was literally unable to put the book down and had to stay up later until I have devoured every page. It is done so brilliantly and explains an awful lot of what has gone on and questions that were raised throughout the book. I won't tell you more because I don't want to spoil it for everyone. The book ends on a excruciating cliff hanger which left me desperate for more. Definitely one of the best books I have read this year which builds up a world which absorbs you in and keeps you hooked from page one.